She needs a new life, he’s determined to maintain the status quo. If they don’t compromise, the whole town loses. Midnight Shelby is starting over. 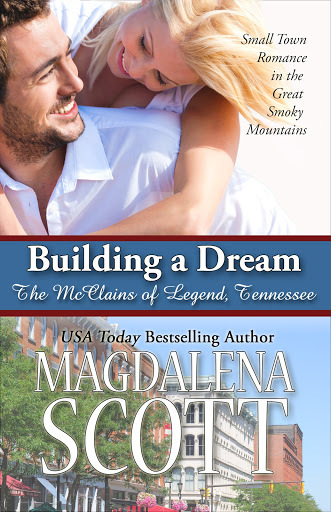 A real estate agent’s virtual tour of a large two-story brick building on the main street of the small town of Legend, Tennessee caught her eye and she’s leaving her smarmy ex-husband, the big city, and corporate life behind. The town is struggling but Midnight has ideas that will give it new life as well. Martin McClain was born and raised in the Legend area. His family has lived there for generations, and he feels a duty to preserve the past. The website his son Daniel created has been good for business, but although Martin is a real estate agent by trade, he’s wary of newcomers’ motivations. Especially Midnight Shelby, who seems bent on changing everything…even him. 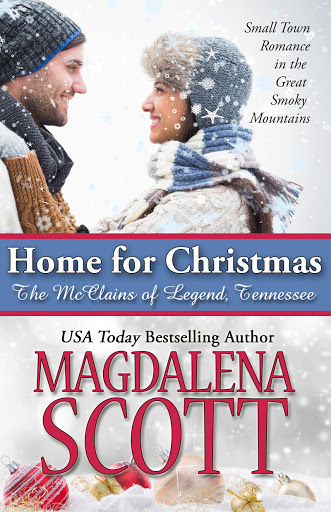 Snowbound in a remote mountain cabin, Rebecca and David can’t wait to be rescued. But the help they need most is from each other. Rebecca Mayfield is a terrific attorney, successful and respected. Her personal life, however, is currently a mess. Her most recent romance ended badly, her only son is out of the country, and it’s almost Christmas. 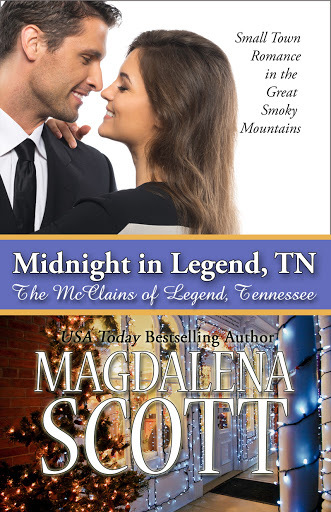 Why not accept her friend Midnight’s invitation for a small town Christmas in Legend, Tennessee? David McClain’s Christmas Eve tradition is to observe a solitary vigil in his remote cabin, in the mountains above Legend. It’s his special time to remember his beloved wife, whose life ended so suddenly just this time of year. A freak blizzard intervenes, sliding Rebecca’s rental car into a snow-filled ditch near David’s cabin. Such close quarters, complete with a blazing fire could be romantic–but Rebecca and David have nothing in common. Or do they? He’s won his daughter’s heart. Can he also regain her mother’s trust? Betsy McClain left Legend, Tennessee two years ago, with a broken heart, a baby to care for, and precious little else. She’s done well in the city, and so has daughter LizBeth Ann. A heartfelt request from Dorothy McClain is the only thing that could bring them back to Legend, even temporarily. Mike McClain wants to get to know his only child, but Betsy isn’t cutting him any slack. Good looks and the old McClain charm seem to be failing him. Betsy is not the same love-struck girl he married, nor the girl who left Legend in a flurry of anger and tears. But he’s changed too. Can’t she see that? Mike is renovating the house where Betsy and LizBeth Ann are staying. Everyone in Legend would like to see them get back together. The only thing standing in the way is Betsy’s stubbornness…or is it Mike’s? When you need an old building renovated fast, and the best contractor in town is an irritating bad boy. Chloe McClain needs a classy art gallery, ASAP. She’s invested years of her life, and everything she owns, in the upcoming event that can make or break her career, and possibly give her beloved hometown a much-needed boost. Chloe has heard that the handsome new builder in town is the best one to hire for the job. She’ll just have to ignore the fact that his personality stinks. Building contractor Greg Andrews thinks Chloe’s pile of bricks should be put out of its misery. But since he knows better than to get on the wrong side of the McClain family, he takes the job. His decision has nothing to do with the way Chloe’s eyes sparkle when she’s excited, or the view when she stomps away from him in her snug jeans. Women like her are bad news–he learned that the hard way. One month to build a dream–or to watch it die. It’s a renovation project that can change their lives. Trying to escape their painful past, Anne and Pete move to the middle of nowhere…and find each other. 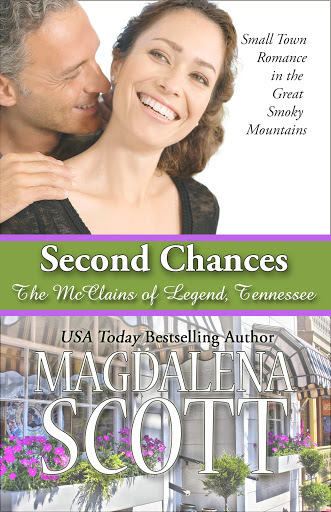 Anne McClain Bradley has returned to Legend, Tennessee after a personal tragedy sent her successful, well-ordered life reeling. Midnight Shelby McClain has offered Anne the apartment over The Emporium, and Anne is cautiously hopeful that her heart, and her family connections in Legend, can heal. Pete Garrity is new in Legend, having been hired as the general manager of The Legend Post-Dispatch by the newspaper’s elderly owner. Pete has a past he won’t discuss, and hasn’t gotten close to anybody in town. As a hideaway, Legend seemed perfect. But now Pete finds himself stuck in Legend with no way out, and worries that his career is finished. What a surprise when Anne Bradley turns up in Legend–she might be just the answer to his dilemma. But every time Anne looks at Pete, she’s reminded of the pain she came here to escape. Legend has a way of healing broken hearts, no matter how longstanding the brokenness. But first one must believe in possibilities…for second chances, and for moving forward with hope. 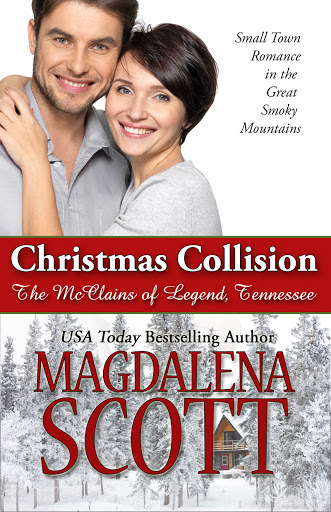 In spite of her intentions to spend Christmas on the beach, Meg is on her way to Legend, Tennessee for a small town Christmas with her boyfriend and his family. 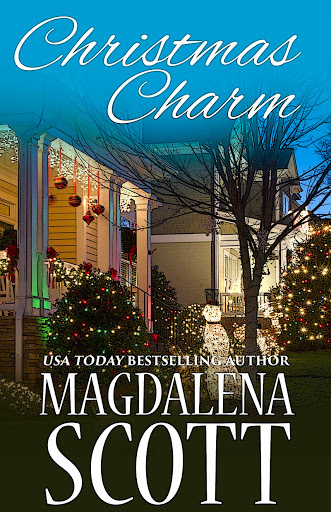 When Christopher’s flight is delayed, Meg finds herself staying with his mother, Anne McClain Bradley, and in the midst of an old-fashioned family holiday with a family that’s not her own. But the McClains, and the other good people of Legend, Tennessee know how to make anyone feel loved and welcomed…especially at Christmas. Can they overcome their past and make a home for a family of three? Maureen McClain didn’t believe in love at first sight until the night of her cousin’s art gallery opening. That’s when she met Damien Phillips. Their first touch was electric, and in the next few weeks their relationship blossomed. But that all ended when she showed up at his Nashville home and witnessed his argument with a pregnant woman who said that her child needed its father. Maureen is concentrating on growing her business, McClain Events, and is putting Damien firmly into her past. Damien Phillips hopes that if he can finally complete painting a portrait of Maureen, he’ll be able to let her go. His life changed the day he and Jamie were arguing, and Maureen overheard. Now he’s fulltime dad to Emma, who looks like the mother who died so tragically. When he’s about to lose his Nashville apartment, fate hands him an opportunity in Legend. Being near Maureen will help him finish the painting, and a small town upbringing, even with a single dad, is his best option for Emma. Falling in love was easy the first time they met. Can Maureen and Damien overcome the past, to create a future for themselves and for Emma? They want to escape their little hometown forever. Even if it means giving up on love. Dorothy Robbins is working hard to build up her Leaving Legend Fund. She wants to finish college, become a pharmacist, and never see her boring little hometown again. But her source of income is a meager hourly wage and tips at Jim Bob’s Saloon, where the only thing worse than the tips are the songs on the jukebox. Charles McClain has been gone from Legend for years—first serving in Vietnam as a Marine, then finishing college and getting a job in Los Angeles. But his new life hit a snag, and suddenly he has time for a long holiday visit with his family, back in the beautiful mountains of Eastern Tennessee. Too bad there’s nothing interesting going on in Legend. But it’s Christmas… The air is cold, hearts are warm, and mistletoe is overhead when you least expect it. Besides, sometimes the path that leads you away can also bring you home. There’s no chance for happiness when your least favorite person is the love of your life. 1978: Eli McClain is in Legend, Tennessee, as an honored guest, and everybody but Jeannie Adams is thrilled about it. She doesn’t want to see his smug, handsome face, or be reminded of the kiss they shared right before he abandoned the small town they both called home. Eli remembers Jeannie as the girl who was always competing with him in school for the best grades. Now, all grown up, she’s just as competitive and stubborn as before–but also completely irresistible. It’s almost a shame he’ll just be in Legend for a few days. And a shame he can never let her know the results of the fame and fortune he left Legend to pursue. 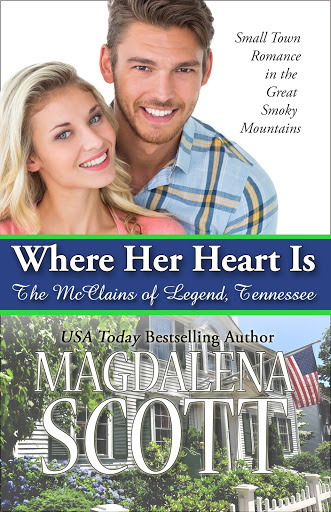 Spend your holiday in Legend with this series prequel, and discover that love is sweeter, and hot cocoa tastes better, in the shadow of the Great Smoky Mountains!